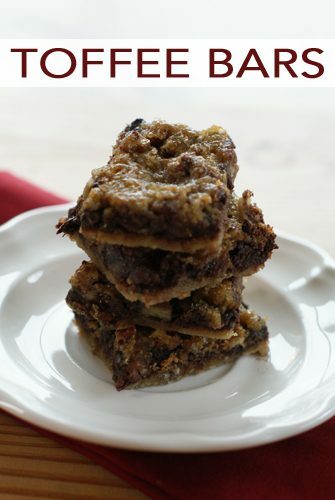 These chocolate-pecan toffee bars combine a shortbread crust with a chocolate-pecan center and a crispy toffee layer on top for a delicious treat that you’ll find hard to resist. We scarfed down the batch I made (thankfully only a half batch!) while decorating our Christmas tree this weekend, and even my girls who don’t like nuts loved them. Make a batch to share at a cookie swap or package them in tissue paper for neighbors or friends…if they last long enough! In a small bowl, mix 1 cup flour, 1/2 cup brown sugar, butter, vanilla extract and salt until well blended. Press into the bottom of an ungreased 9″ x 13″ inch pan. Bake at 350 degrees for 10 minutes or until lightly browned. Remove from oven and cool for 5 minutes. While the crust is baking, combine remaining brown sugar and flour with baking powder and eggs until well blended. Add chocolate chips and nuts and stir gently. Spread over crust. Bake at 350 degrees for an additional 20-25 minutes or until deep brown and set in the center. Cool completely before cutting into bars.